On 22nd January while fans gathered in the Hard Rock Cafes in various cities of the world or linked together on the Internet, Rhett, Mandy, other close relatives, Andrew and Shelley Farriss, Tim Farriss, Kirk Pengilly and Garry and Jodie Beers were arriving at Kell and Susie’s Sydney apartment. 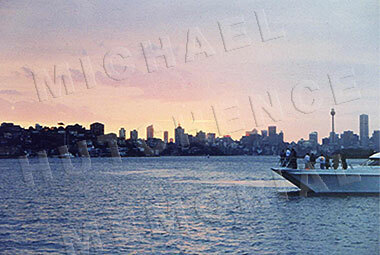 After drinks and re-introductions to Erana, and some final planning with the minister, the party made their way down to the harbour side jetty where they were joined by others including Jimmy Barnes and his wife Jane, Jenny Morris, Michele Bennett, Richard Lowenstein, Kell’s sister Iris Croy Magee, Michael’s cousin from England, Sonya Hutchence, Paul Ellis, Greg Perano (Michael’s close friend), INXS tour manager David Edwards, Paul Horton, Andrew Young, Gary Grant, Tony Woodall (Michael’s personal security man), long-time friend Hiraani (whose name Tiger bears) and John Clapham. Fishermen arriving at the jetty could hardly have realized the significance of the gathering before them as sun-glassed mourners, unnoticed, quietly boarded the vessel that would carry Michael’s ashes to a final resting place. Kell was not sure where to locate the boat to carry out the service but as they solemnly headed off out of Rose Bay he saw that the wind was fairly brisk and as they passed the point of the Vaucluse Peninsula, he asked the skipper to turn right and go into the lee of the hills away from the wind and there luckily he spotted a mooring right opposite Milk Beach near to where Michael had once considered purchasing a house. 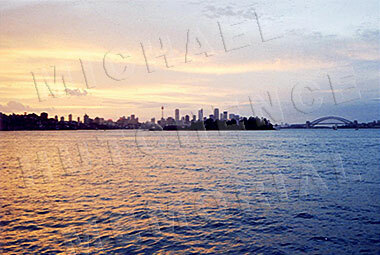 He loved Australia and particularly the beauty of Sydney Harbour. The Pastor called the group to the bow of the boat. Rhett held Michael’s ashes in a beautifully fashioned wooden urn, made from the same timber as Michael’s casket. There was an awkwardness in the silence as the mourners gradually made their way out from the vessel’s cabin. He firstly referred to a story told by Tim. The band were in Australia travelling to an outback gig in a light aircraft. The pilot had forgotten his maps, they had lost their way and so they were trying to follow roads to get back home. Andrew is somewhat apprehensive about flying, so the situation became challenging to say the least, when the pilot fell asleep on Andrew’s shoulder, leaving a very nervous Andrew with the controls as the plane continued through the darkness. This was to illustrate that there is no fear in heaven for those who are trusting in Jesus and that He is the good pilot who leads us safely to our final destination. The second story referred to how during a show one night, the backing vocalist, Jenny Morris was wearing jeans that were not quite tailored to her size and so in front of an audience of thousands, the jeans split. The final INXS story referred to the night the band were throwing each other into the audience. Up until the point that Kirk was thrown in, the audience obligingly had been cushioning their fall. But the crowd, seeing Kirk coming guitar and all, parted, leaving poor Kirk to land heavily on the floor. “Heaven is not like that. We are not thrown out into the unknown only to land painfully. We are lovingly led there. It is certainly true all pain is taken… there are no tears in heaven”. Only the singing voice could have portrayed the sorrow for Michael during that poignant moment… and as the sun retreated behind the horizon a day and an era had come to an end. The silence was broken by Pastor Dennis Patterson, who now invited family and friends to informally eulogize Michael. By this time everyone aboard the vessel was smiling, laughing, crying, celebrating Michael. It seemed now an appropriate time to continue celebrating Michael. It was 22nd January, Michael’s birthday. Kell called for glasses and drinks and proposed a toast to Michael. “Happy birthday, Michael!” was echoed around the vessel. The evening was still young as a buffet dinner was served. Family and friends grouped in huddles, comforting one another, exchanging stories. It was a sweet time with sweet memories of Michael. Many expressed feeling a great comfort come over them during the ceremony. “I have never felt such comfort,” said Jenny Morris. Jimmy Barnes gave the minister a hug. It was Jimmy’s way of saying, “Thank you.” Kell and Susie, Rhett and Mandy, Tim, Andrew, Kirk, Garry, and all of Michael’s dearest friends somehow found the grace and strength that night to say goodbye to Michael. At around 10:00 pm the vessel weighed anchor, moved off from the memorial waters and continued on it’s journey.